Submitted by Norm Roulet on Fri, 06/04/2010 - 08:00. The chart above presents some of the most important data in the world for citizens to understand about the future physical and economic health and well being of all people on Earth, and for all life on Earth - the Total Levelized Costs of Electricity including TS&M shown in Exhibit ES-11 is the cost breakdown from the ASSESSMENT OF POWER PLANTS THAT MEET PROPOSED GREENHOUSE GAS EMISSION PERFORMANCE STANDARDS - November 5, 2009 - REVISED 4/22/2010 that demonstrates that all the technologies available and in immediate development to burn coal to generate utility scale power at the emissions standards set for California are more expensive than generating electricity by wind - significantly more expensive. Solar has better economic value than coal as well. The National Renewable Energy Laboratory (NREL) just conducted a comparison of the relative impacts of various financial, technological, and wind resource variables on the LCOE from utility-scale wind projects and found a base case range of $54-74/MWh. The National Renewable Energy Laboratory (NREL) also conducted a 2006 study "Economic, Energy, and Environmental Benefits of Concentrating Solar Power in California" which found the LCOE for utility-scale solar energy production will be around $115 by 2015 (it is not much higher today), making it less expensive than natural gas technologies anticipated to be available in this time frame - and this study determined additional benefits: "In terms of economic return, for each 100 MW of installed capacity, the CSP plant was estimated to create about $628 million in impact to gross state output compared to an impact of about $64 million for the combined cycle plant and $47 million for the simple cycle plant." Much of the benefit is that more local jobs are created installing and operating solar - jobs are good! As illustrated at the top of this post, and throughout the report below, building a greenfield supercritical pulverized coal plant without carbon capture starts at LCOE $80/MWh, and increases 50% to $120 with carbon capture and sequestration to the 1,000 lb/MWh level... increases another $24/Mwh to LCOE $144 to meet the 90% factor. The greenest coal dream of all, gasification, starts at LCOE of $118/MWh without carbon capture and rises to $149/MWh at the 1,000lb standard... $175/MWh for the 90% standard. Compare any and all of those costs to what we pay on balance today to generate electricity from dirty coal plants... $34/WMh... and realize how far up costs must go to addess our environmental crisis in this region for just this one component of our pollution... CO2 management from coal burning utility power plants in the region. In places that depend on coal for their power generation, like in Ohio - where over 90% of electricity consumed here is generated by burning coal dirty - where inadequate effort has been made to develop utility-scale alternative energy solutions and to reduce CO2 and other emissions from existing coal power plants, electricity consumers must expect significant increases in utility costs. Ohio must clean-up excessively-polluting coal-burning point sources to meet new Federal and global environmental requirements - know cleaning up from our coal legacy will cost citizens here $billions, and make Ohio a high-cost energy state. From a global perspective, America and developing nations have pinned their economic futures on cheap energy from cheap coal that is not renewable and not cheaply clean... never really clean... meaning economic development in America and developing nations will be stalled by energy and environmental crises - these nations include India and China, where a new dirty coal plant goes on-line weekly, on average. That is not sustainable, and clean coal is not an alternative. Consider insightful perspectives on this concern from the recent New York Times editorial "Coal Sans CO2: Appealing Pipe Dream": The issue isn’t technology or geology (finding safe storage sites for huge volumes) nearly so much as cost. And remember, this isn’t about the affordability of the technology in the United States or Europe. It’s about the cost of deployment at large scale in the coal-boom countries, China and India. Where the NYTimes is wrong is that this is about the affordability of the technology in the United States because we certainly cannot afford clean coal in Ohio. Nor can we afford to address pollution from coal burning and other pollution issues at Mittal and other industrial sites across the state, which operate with different regulations. 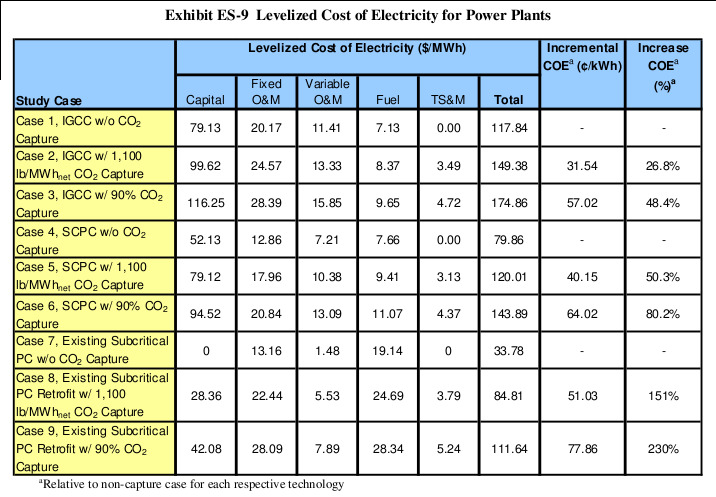 The timely, excellent, exhaustive Department of Energy study below of the reality of coal energy costs now and in the future confirms highly-polluting electric power generated by existing subcritical pulverized coal plants without CO2 capture and sequestration is cheap - LCOE of $34/MWh - and it finds that adding the cost to retrofit these existing plants to meet California emissions standards of 1,000 lbs of CO2/MWh more than doubles LCOE to $85/MWh... reducing emissions to a lower standard of 90% of current emissions brings LCOE over 3X costs without carbon capture, at $112/MWh. And that is about as cheap as coal shall ever be or get... and the new cleaner coal burning technologies are much higher cost than that. I've included below the text and related exhibits for the entire executive summary and conclusion from this 326 page .PDF, to make them more user-friendly and readable - read below about Ohio's great black hope that is hopeless... a FutureGen economy with no future... and reflect on how on Earth Ohioans will dig ourselves out of the mess our leaders dug us into digging for the clean in coal that is not and never will be. Greenhouse gas (GHG) emissions continue to receive increased scrutiny because of their perceived relation to global warming. Numerous bills have been introduced in both the United States Senate and House of Representatives that would limit GHG emissions. The bills vary primarily in the economy sectors regulated, the extent of GHG reductions and the compliance year, but all represent reductions from the “business-as-usual” scenario. In June, 2009 the House of Representatives passed the American Clean Energy and Security Act of 2009 (H.R. 2454) which would limit GHG emissions starting as soon as 2012. The Senate has not yet acted on the House bill or any companion bill, but deliberations are ongoing. Adding to the legislative momentum for carbon regulation, in September, 2009 the Environmental Protection Agency proposed a rule that would limit future regulation of GHG emissions under the Clean Air Act to industrial facilities that emit 25,000 tons or more of carbon dioxide annually. The proposed rule would impact facilities such as power plants, refineries, and factories, which produce nearly 70 percent of domestic GHGs. In addition to proposed Federal regulations, various states have proposed or enacted legislation to reduce GHG emissions. The most imminent regulations were enacted by the state of California and would limit GHG emissions from in-state energy producers or out-of-state producers supplying electricity to California to 1,100 lb CO2/net-MWh . A sampling of the legislation is provided in Section 1.1. The subcritical PC retrofit case was based on a generic plant site, but is representative of a western plant that could supply electricity to California and hence have to meet the 1,100 lb CO2/net-MWh standard. The elevation used was 6,700 ft, which is the average elevation of Wyoming. For consistency between cases, this same elevation was used for all technologies. The fuel used in all nine cases was representative of a coal from the Powder River Basin (PRB) and has the same composition as the subbituminous coal used in an as yet unpublished NETL study entitled “Cost and Performance Baseline for Low-Rank Coal Fossil Energy Plants.” The nine cases are summarized in Exhibit 1-1. Nine power plant configurations were analyzed as listed in Exhibit 1-1. The list includes three IGCC cases utilizing Shell gasifiers each with and without CO2 capture; six PC cases, three greenfield supercritical and three existing subcritical plants, each with and without CO2 capture. The methodology used information provided by the technology vendors (IGCC) and conventional models and existing plant information (PC) to perform steady-state simulations of the technology using the Aspen Plus (Aspen) modeling program. The resulting mass and energy balance results from the Aspen model were used to size major pieces of equipment. These equipment sizes formed the basis for cost estimating. Costs were scaled from estimates provided previously on similar technologies using PRB coal. The original estimates were developed through a combination of vendor quotes and scaled estimates from previous design/build projects. Performance and process limits were based upon published reports, information obtained from vendors and users of the technology, and cost and performance data from design/build utility projects. Baseline fuel costs for this analysis were determined using data from the Energy Information Administration’s (EIA) Annual Energy Outlook (AEO) 2007. The first year (2015) cost used is $0.57/GJ ($0.61/MMBtu) for coal (Montana Rosebud Powder River Basin) on a higher heating value (HHV) basis and in 2007 U.S. dollars. All plant configurations were evaluated based on installation at a greenfield site, with the exception of the existing subcritical PC plant. Typically, greenfield plants are state-of-the-art plants with higher efficiencies than the existing average power plant population. Consequently, these plants would be expected to be near the top of the dispatch list, and the study capacity factor is chosen to reflect the maximum availability demonstrated for the specific plant type, i.e. 80 percent for IGCC and 85 percent for PC. A capacity factor of 85 percent was also used for the subcritical PC case to be consistent with the SC PC greenfield plant. The performance results are presented in Exhibit ES-1 and Exhibit ES-2. The net power output varies between technologies because the combustion turbines in the IGCC cases are manufactured in discrete sizes, but the boilers and steam turbines in the greenfield PC cases are readily available in a wide range of capacities. The net output in the subcritical retrofit PC plant is limited by the capacity of the existing boiler and steam turbine. 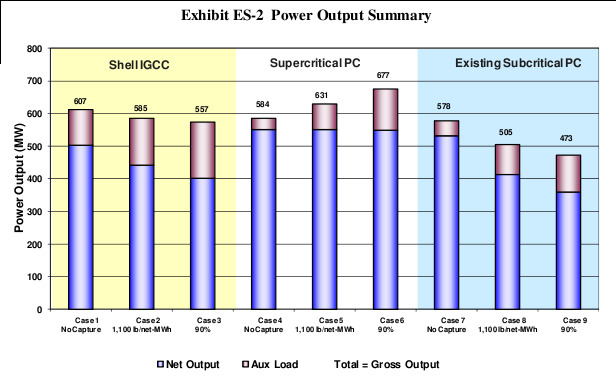 The result is that all of the greenfield supercritical PC cases have a net output of 550 MW, the subcritical retrofit cases have net outputs ranging from 532 to 359 MW, and the IGCC cases have net outputs ranging from 502 to 401 MW. The range in IGCC net output is caused by the increased elevation, the much higher auxiliary load imposed in the CO2 capture cases primarily due to CO2 compression, and the need for extraction steam in the water-gas shift reactions, which reduces steam turbine output. Higher auxiliary load and extraction steam requirements can be accommodated in the greenfield supercritical PC cases (larger boiler and steam turbine) but not in the IGCC or subcritical retrofit PC cases. For the IGCC cases or subcritical retrofit PC cases, it is impossible to maintain a constant net output from the steam cycle given the fixed input (combustion turbine for IGCC and existing boiler capacity for subcritical retrofit cases). In addition, the combustion turbine output increases with increasing capture levels because of the higher flue gas moisture content due to the higher hydrogen content of the syngas, while the mass flow remains relatively the same. The definition of Energy Penalty used in this study to evaluate the impact of energy losses due to the addition of CO2 capture controls is the difference in net power plant efficiency expressed in absolute percentage points as shown in the following equation. 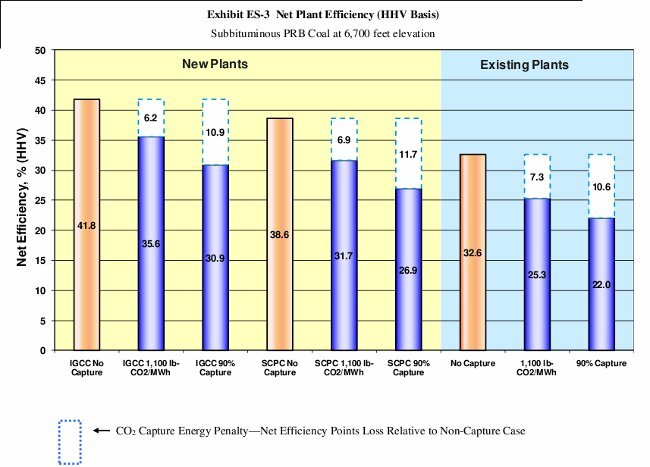 The net plant efficiency (HHV basis) for all 9 cases is shown in Exhibit ES-3. The IGCC no-capture case has the highest net efficiency of the technologies modeled in this study with an efficiency of 41.8 percent. The energy penalty for the 1,100 lb/net- MWh CO2 emission level is smallest for IGCC and highest for the retrofit subcritical PC case. The new SCPC no-capture case has a lower net efficiency compared to the new IGCC no-capture case, and the CO2 Capture Energy Penalty for the SCPC cases is higher at 6.9 and 11.7 net efficiency points lost relative to the SCPC no-capture case for the 1,100 lb CO2/net-MWh case and 90 percent capture case, respectively, resulting in lower net power plant efficiencies compared to the IGCC power plants equipped with CO2 capture. The estimated efficiency of the existing subcritical PC using Montana Rosebud PRB coal is 32.6 percent. There is a 7.3 percent penalty to achieve the 1,100 lb/net-MWh CO2 emission limit and 10.6 percent penalty for the 90 percent capture case. The retrofit cases have the lowest efficiency for each of the three cases, but the smallest energy penalty for the 90 percent capture case. normalized by net plant output for Exhibit ES-4. 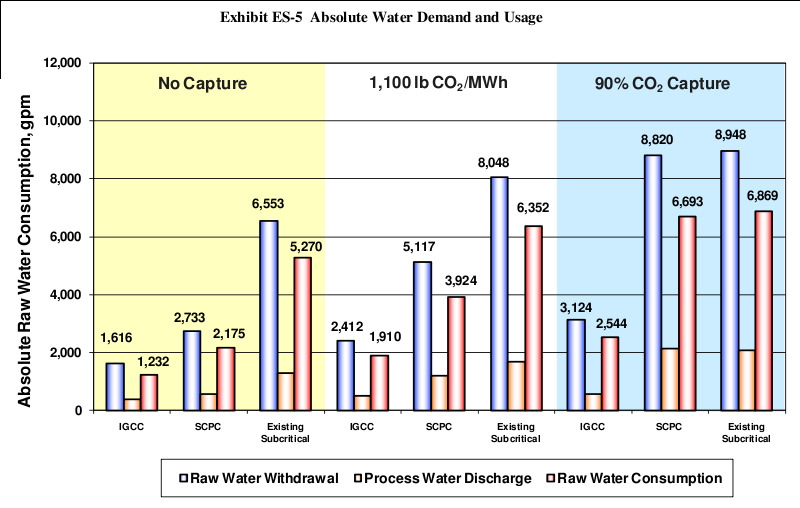 Exhibit ES-5 shows absolute water withdrawal and consumption. Water demand represents the total amount of water required for a particular process. Some water is recovered within the process, primarily as coal moisture from the drying process and syngas condensate (IGCC cases) or flue gas condensate (PC cases), and that water is re-used as internal recycle. Raw water withdrawal is the difference between water demand and internal recycle. Some water is returned to the source, namely sour water stripper blowdown (IGCC cases) and cooling tower blowdown (IGCC and PC cases). The difference between raw water withdrawal and water returned to the source (process discharge) is raw water consumption, which represents the net impact on the water source. The largest consumer of water in the plant is the makeup to the cooling system. The greenfield plants (IGCC and supercritical PC) use parallel wet (50 percent)/dry (50 percent) cooling. The existing subcritical PC uses only an evaporative cooling tower. The difference in cooling systems has a significant impact on water consumption. In all cases the primary water consumer is cooling tower makeup, which ranges from 60 to 94 percent of the total raw water consumption. 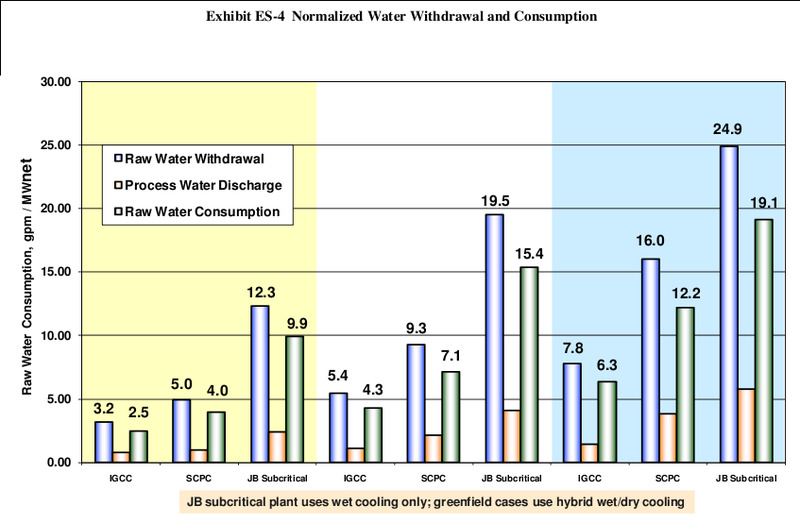 For the non-capture cases, IGCC has the least amount of raw water withdrawal and consumption, followed by the new SCPC and existing subcritical PC. The relative total raw water consumption is 4.0: 1.6: 1.0 normalized by net power output (gpm/MWnet) (subcritical PC: SCPC: IGCC). The relative results are as expected due to the cooling systems employed and the higher steam turbine output in the PC cases. These factors combined result in higher condenser duties, higher cooling water requirements and ultimately higher cooling water makeup. Among the CO2 capture cases, raw water consumption increases (relative to non-capture cases) much more dramatically for the PC than for IGCC cases because of the large cooling water demand of the CO2 scrubbing process which results in much greater cooling water makeup requirements. Comparing the 1,100 lb CO2/net-MWh emission limit cases, the relative raw water consumption is 3.6 : 1.7 : 1.0 normalized by net power output (subcritical PC: SCPC: IGCC)—meaning that the SCPC plant has a net consumption that is 1.7 times greater than the IGCC plant at the same capture rate. The relative raw water consumption comparison for the 90 percent capture cases follows the same trend. CO2 capture increases the absolute raw water consumption of the subcritical PC retrofit cases by the least amount of the technologies evaluated: a maximum of 30 percent at the 90 percent capture level. The primary reason for the small increase is the reduction in condenser duty, which mostly offsets the increase in duty due to the Econamine process. The consequence is a significant reduction in net plant power output. With the addition of CO2 capture, supercritical PC raw water consumption increases by 208 percent and IGCC by 106 percent. The substantial increase in the SC PC case is driven by the high Econamine water requirement and the increase in size of the steam turbine to maintain a constant net output. Hence the steam turbine condenser duty remains high and the Econamine cooling load is simply additive. Gasifiers and Syngas Coolers – 15 percent on all IGCC cases – next-generation commercial offering and integration with the power island. Two Stage Selexol – 20 percent on all IGCC capture cases – lack of operating experience at commercial scale in IGCC service. Mercury Removal – 5 percent on all IGCC cases – minimal commercial scale experience in IGCC applications. CO2 Removal System – 20 percent on all PC capture cases - post-combustion process unproven at commercial scale for power plant applications. Combustion Turbine Generator – 5 percent on all IGCC non-capture cases – syngas firing and ASU integration; 10 percent on all IGCC capture cases – high hydrogen firing. Instrumentation and Controls – 5 percent on all IGCC accounts and 5 percent on the PC capture cases – integration issues. The TPC, TOC and TASC for the nine power plant configurations are shown in Exhibit ES-6 in June 2007 dollars. The normalized TOC for each technology is shown in Exhibit ES-7. 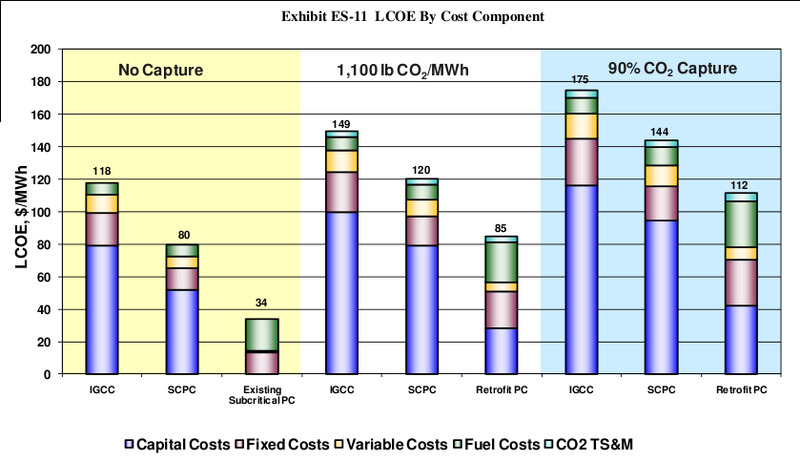 Retrofitting the existing subcritical PC plant with CO2 capture designed to meet a CO2 emissions limit of 1,100 lb/net-MWh has a TOC of $1,348/kWe and one designed for 90% CO2 capture has a TOC of $1,999/kWe. 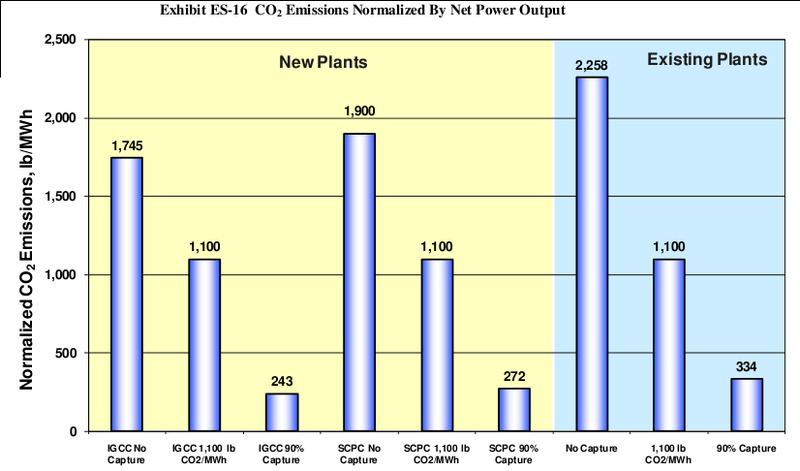 The retrofit cost for an existing plant is 59 percent lower than a greenfield application at an emissions limit of 1,100 lb CO2/net-MWh and 50 percent less at 90 percent CO2 capture primarily because of the assumption that the subcritical PC plant is paid for and the cost of capital pertains only to the carbon capture and sequestration portion of the plant, while in the greenfield cases the cost of capital pertains to the total plant cost. If New Source Review (NSR) is triggered, the existing subcritical PC retrofit plant could require SCR. The retrofit with SCR designed to meet a CO2 emissions limit of 1,100 lb/net-MWh and 90% CO2 capture will have a TOC of $1,717/ kWe and $2,430/ kWe, respectively. Even with SCR, the TOC of the retrofit cases is less than greenfield plants with CO2 capture for equivalent emissions reduction primarily because of the assumption that the original subcritical PC plant capital cost has been paid. Comparing the greenfield IGCC and PC cases without CO2 capture, the supercritical PC has the lowest TOC at $2,296/kWe followed by IGCC with a cost of $3,128/kWe. The IGCC cost is 36 percent greater than the supercritical PC cost. Comparing the greenfield IGCC and PC cases with CO2 capture, the supercritical PC has the lowest TOC at $3,323/kWe at an emissions level of 1,100 lb CO2/net-MWh and $3,969/kWe at a capture level of 90 percent. The corresponding IGCC cases have a TOC of $3,938/kWe and $4,595/kWe. A new IGCC power plant built with CO2 capture designed to meet a CO2 emissions limit of 1,100 lb/net-MWh will add $810/kWe in incremental capital cost. The same IGCC power plant designed for 90% CO2 capture will have an incremental cost of $1,467/kWe. A new SCPC power plant built with CO2 capture designed to meet a CO2 emissions limit of 1,100 lb/net-MWh will add $1,027/kWe in incremental capital cost and one designed for 90% CO2 capture will have an incremental cost of $1,673/kWe. The current dollar, 30-year LCOE was calculated for each case using the economic parameters shown in Exhibit ES-8. The cases were divided into three categories, all undertaken at an investor owned utility: high risk projects with a five year construction duration (all IGCC cases and greenfield SC PC capture cases); low risk projects with a five year construction duration (greenfield SC PC non-capture case); and high risk projects with a three year duration (retrofit PC capture cases). High risk projects are those in which commercial scale operating experience is limited. The IGCC cases (with and without CO2 capture) and the PC cases with CO2 capture were considered to be high risk. The non-capture PC case was considered to be low risk. The LCOE results are shown in Exhibit ES-9 with the capital cost fixed operating cost, variable operating cost, fuel cost and TS&M cost shown separately. When carbon capture is implemented, the net power output of the subcritical PC plant decreases to 413 MW and 359 MW for the 1,100 lb/net-MWh and 90 percent capture cases, respectively. The current electricity cost for the subcritical PC plant was estimated to be $19/MWh using the Energy Velocity Database. An estimated cost for the plant property taxes and insurance was added to the fixed O&M costs for a total current cost of electricity of $26.29/MWh. 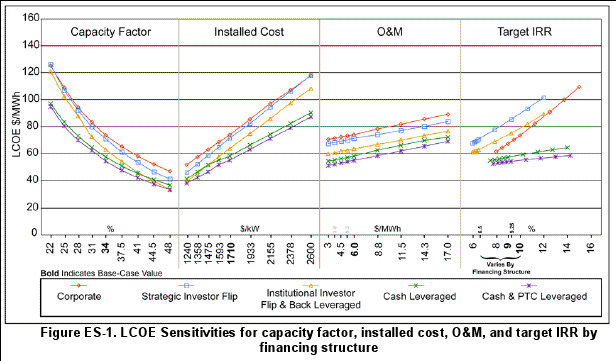 The current cost was levelized using the same factor applied to the retrofit cases yielding an LCOE of $33.78/MWh. By virtue of having the intitial plant capital investment paid off, the subcritical PC retrofit case has the lowest LCOE of all cases. Comparing the greenfield IGCC and PC cases without CO2 capture, the LCOE of the PC case is 32 percent lower than the IGCC case. 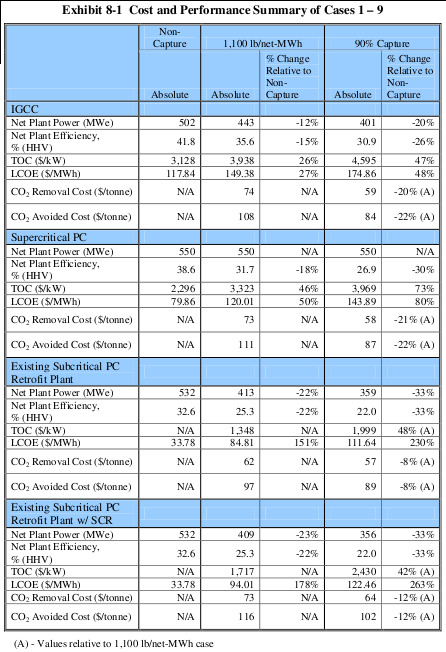 Comparing the greenfield IGCC and PC cases with CO2 capture, the supercritical PC has the lowest LCOE at $120.01/MWh at a capture level to meet a CO2 emissions level of 1,100 lb/net-MWh and $143.89/MWh at a capture level of 90 percent. The LCOEs of the SCPC cases are 20 percent and 18 percent lower than the corresponding IGCC cases. For reference, the Energy Information Administration reports the average residential retail price of electricity in 2007 was $106.5/MWh. The cost of CO2 capture was calculated in two ways, the cost of CO2 removed and the cost of CO2 avoided, as illustrated in Equations 1 and 2, respectively. The LCOE with CO2 removal includes the costs of capture and compression as well as TS&M costs. The resulting removal and avoided costs are shown in Exhibit ES-12 for each of the six capture technologies modeled. The total cost of CO2 avoided meeting a 1,100 lb/net-MWh CO2 emissions limit was estimated to be $108/tonne ($98/ton) for a new IGCC, $111/tonne ($100/ton) for a new SCPC, and $97/tonne ($88/ton) to retrofit the existing subcritical PC plant. At the 90 percent carbon capture level, the avoided cost was estimated to be $84/tonne ($76/ton) for a new IGCC, $87/tonne ($79/ton) for a new SCPC, and $89/tonne ($81/ton) to retrofit the subcritical PC plant. 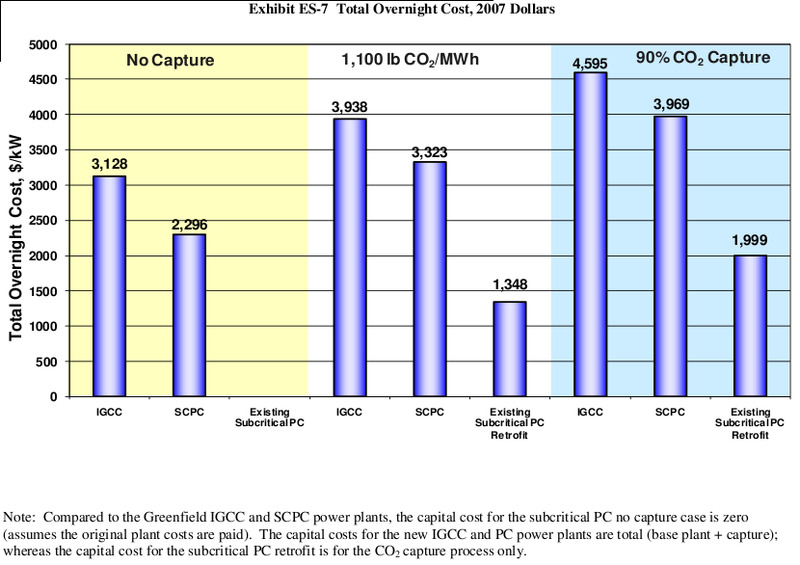 The CO2 avoided costs are lowest for the existing subcritical PC plant at an emission level of 1,100 lb CO2/net-MWh primarly because there is no capital cost associated with the power plant itself (CO2 capture only) and because of the shorter construction duration (3 years versus 5 years for the greenfield plants). At 90 percent capture the reduction in net output offsets the capital cost savings and the existing PC plant has a slightly higher CO2 avoided cost compared to greenfield SCPC and IGCC. 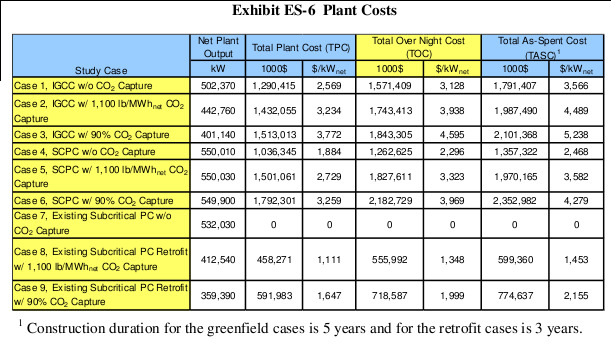 The cost of CO2 removed is 16 percent lower for the subcritical PC retrofit case compared to the greenfield PC and IGCC cases at a CO2 emission limit of 1,100 lb/net-MWh. The cost of CO2 removed is fairly constant for all technologies at the 90 percent capture level, ranging from $57-$59/tonne ($52-$54/ton). The normalized cost of CO2 removed and avoided is lower for 90 percent capture cases compared to 1,100 lb/net-MWh cases mainly because of economies of scale. The size of CO2 capture equipment increases in proportion to the amount of CO2 captured, but the costs increase less than proportionately. 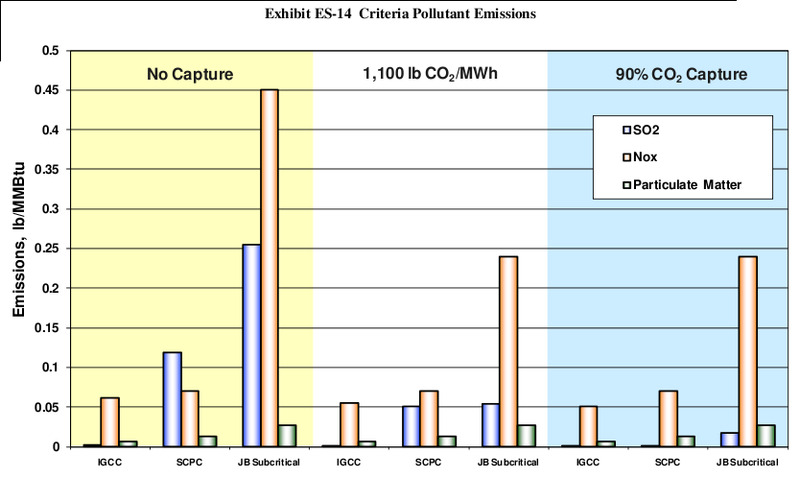 The environmental targets for each power plant scenario are summarized in Exhibit ES-13 and emission rates of SO2, NOx, PM, Hg and CO2 are shown graphically in Exhibit ES-14 through Exhibit ES-16. Targets were chosen on the basis of the environmental regulations that would most likely apply to plants built in 2015. IGCC cases use the EPRI targets established in their CoalFleet for Tomorrow work as documented in the CoalFleet User Design Basis Specification for Coal-Based Integrated Gasification Combined Cycle (IGCC) Power Plants: Version 4. Supercritical PC cases are based on best available control technology. The Existing Subcritical Plant environmental targets are based on typical subcritical PC emissions and the Subcritical Retrofit Plant is based on upgrades required to accommodate CO2 capture. 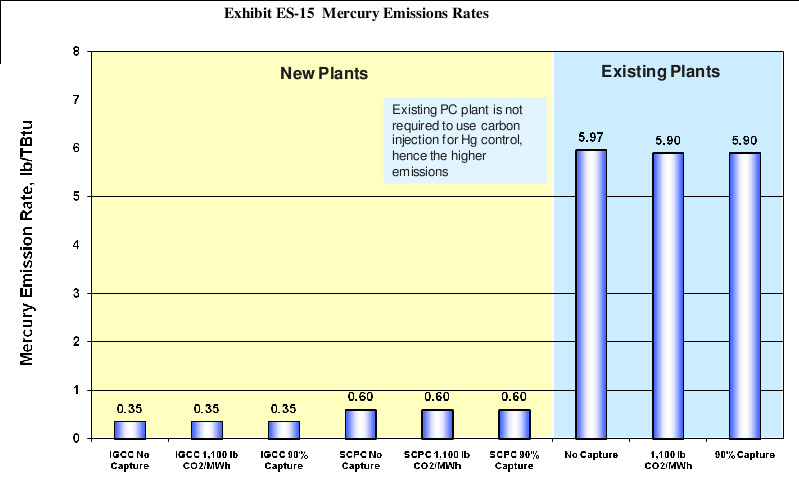 The IGCC baseline plant generates the lowest criteria pollutant emissions (NOx, SOx, PM, and mercury), followed by supercritical PC and then existing subcritical PC. In cases with no carbon capture, IGCC emits 8.2 percent less CO2 than supercritical PC and 23 percent less CO2 than existing subcritical PC per unit of net output. The relative emissions are indicative of the net efficiencies of each technology. In the IGCC cases the nominal 90 percent CO2 reduction was accomplished by adding two sour gas shift (SGS) reactors to convert CO to CO2 and using a two-stage Selexol process with a second stage CO2 removal efficiency of up to 95 percent, which resulted in 90 percent reduction of CO2 in the syngas. This number was supported by vendor quotes. In the 1,100 lb CO2/net-MWh capture case, the 2 gasifier trains each have 1 SGS reactor with a bypass to achieve the emission limit, which resulted in 46 percent carbon capture. The lowest LCOE for all cases is the subcritical PC and subcritical PC with retrofit, mainly due to the assumption that the original plant debt has been retired. The non- capture LCOE for the subcritical PC is 71 percent less than the non-capture IGCC case and 58 percent less than the non-capture SC PC case. 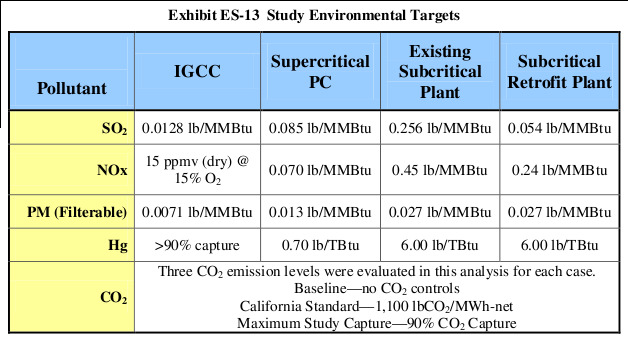 The 90 percent CO2 capture LCOE for the subcritical PC is 36 percent less than the corresponding IGCC case and 22 percent less than the SC PC case. The IGCC cases have the lowest percent change in LCOE from the non-capture case ($117.84/MWh) to the capture cases, with 27 percent for the 1,100 lb CO2/net-MWh case and 48 percent for the 90 percent capture case. However, the absolute LCOE is highest for IGCC cases relative to the SC PC and subcritical PC cases. 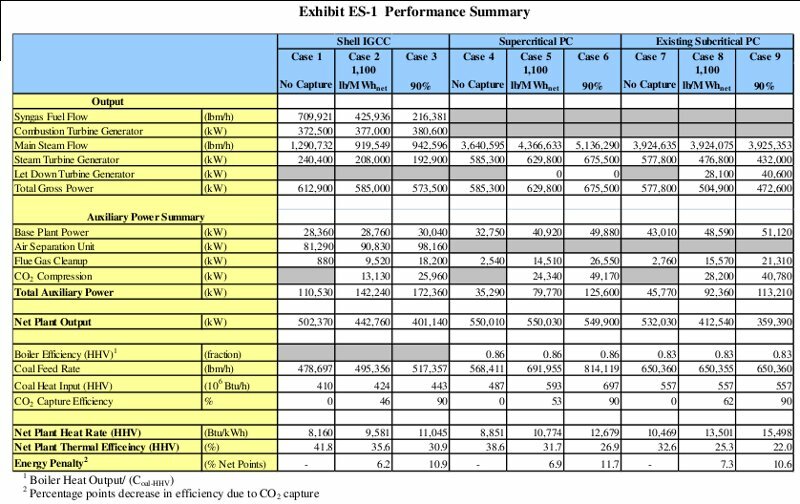 The existing subcritical PC plant with SCR has the highest percentage change in LCOE from the non-capture case ($33.78/MWh) to the capture cases with 178 percent and 263 percent for the 1,100 lb CO2/net-MWh case and the 90 percent capture case, respectively. This is somewhat misleading because the LCOE of the existing non-capture subcritical PC plant does not have a capital cost component (plant is assumed to be paid for). For the 1,100 lb CO2/net-MWh cases, the IGCC plant has the smallest energy penalty relative to the non-capture case at 6.2 absolute percentage points. SC PC is next with an energy penalty of 6.9 percentage points and the subcritical PC retrofit has the largest energy penalty at 7.3 percentage points. For the 90 percent capture cases, the subcritical PC retrofit plant has the smallest energy penalty relative to the non-capture case at 10.6 absolute percentage points. IGCC is next with an energy penalty of 10.9 percentage points and the SC PC plant has the largest energy penalty at 11.7 percentage points. The greenfield supercritical PC plant has the highest change in normalized TOC at 45 percent for the 1,100 lb/net-MWh case and 73 percent for the 90 percent capture case. While the net power for the SC PC capture and non-capture cases remained the same, the gross power output increased. This caused the increase in the capital costs to be greater than the greenfield IGCC cases and the existing subcritical PC retrofit, in which net power was derated to accommodate CO2 capture. 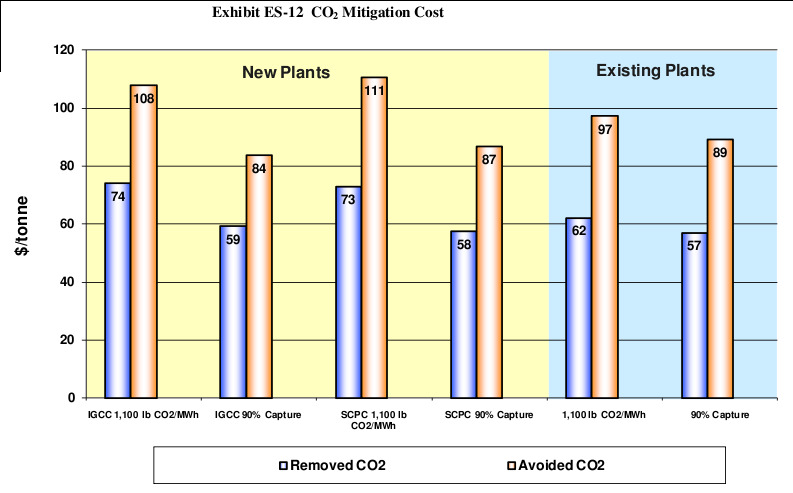 The costs of CO2 captured and avoided were nearly identical for the SC PC and IGCC cases. 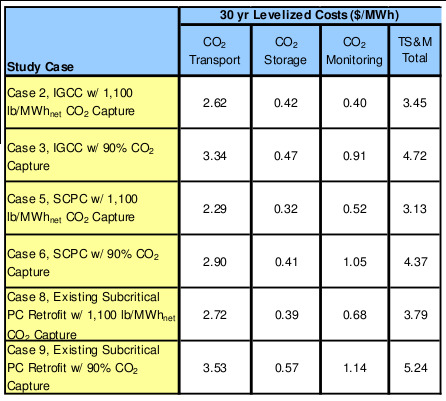 The existing subcritical PC case has the lowest CO2 removal costs at both CO2 emissions levels and also the lowest CO2 avoided cost at the 1,100 lb CO2/net-MWh capture level. The CO2 avoided cost at 90 percent capture level is slightly higher than the IGCC and SC PC cases. systems analysis studies at the Department of Energy’s National Energy Technology Laboratory. Vendor discussions that occurred as part of the other studies led to improved technology information that was incorporated into the Aspen models for this study. The updated models led to revised performance estimates, which were then used to update the cost estimates. Thereference costs used for this study were also updated through efforts on other studies, and the most recent costs have been incorporated. In addition, owner’s costs were added to the Total Plant Cost previously reported, and the capital component of levelized cost of electricity now includes owner’s costs. The updated results are presented in the current revision (revision 2) of this report. Details of the modeling updates and cost methodology changes are included in the body of the report and are identified by italicized font.